Milan, 29 September 2016 – Prysmian Group, world leader in the energy and telecom cable systems industry, is ready to launch a new breakthrough cable technology for the development of power transmission grids that will ensure higher electrical performances, lower costs and better environmental sustainability. 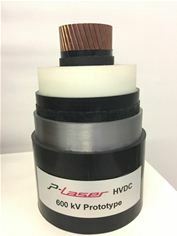 The Group announces today the successful development and testing of its new P-Laser 600 kV cable system for High Voltage Direct Current (HVDC) applications. P-Laser is the name given to the most advanced and innovative technology using an in-house developed thermoplastic material – known as HPTE (High Performance Thermoplastic Elastomer) – that permits a more efficient cable production with lower environmental impact than traditional XLPE, where the manufacture is performed in a single and continuous process. A key feature of this new insulation technology is that, compared to XLPE, it does not require a chemical reaction during manufacture to achieve the material properties required for the long term electrical integrity of HVDC insulation systems. This feature gives the additional benefit of shorter production times and results in both reduced energy consumption as well as lower greenhouse gas emissions. P-Laser technology is fully compatible with existing cable and accessory technologies and provides a better electrical performance and a higher reliability in comparison to traditional XLPE-insulated cables.